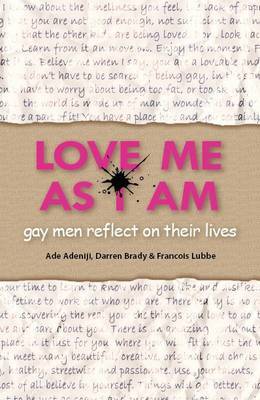 Love Me As I Am is an anthology comprising the letters and writings of 24 gay men, as they reflect on the adolescent experiences that have most impacted their lives; including reflections on where they are presently in their lives. Whilst embarking on this courageous journey back into time, the men not only allow themselves to heal some of the wounds of their past, but they also give readers a bird's eye view of some of the key moments that shape the lives of so many gay men. It is an eye opening and empowering journey which people from all walks of life will be able to relate to, regardless of their sexual orientation. As the world slowly transforms into a more tolerant and accepting place, we can all play a part in making a difference... one book at a time. All profits gained by the publishers, The Quest, from the sale of the book will be donated to the UK charity, Diversity Role Models (Charity no. 1142548).